With the Li-Ion battery, you will see a steady yellow-red phase on your battery meter for about the last 1/2 mile. For proper travel distance planning you need to observe early signs of battery weakness, typically occurring during the last 2-3 miles. There is a brief switch from green to yellow on inclines or when accelerating from a stop, and returning to green when reaching normal driving conditions. Also keep in mind that a battery in this state of discharge is more prone to an overload shut-off. Here's what the owner's manual for the TravelScoot's Li-Ion Battery says about battery overload. It sounds like exactly what happened to me. I still prefer this battery. I'll just be better prepared if/when it happens again. Unlike SLA (Sealed Lead Acid) and NiMH (Nickel-Metal-Hydride) batteries, the Li-Ion battery has a Protection Circuit Board (PCB), which controls charging and discharging. An important feature of the PCB is the overload protection. Light duty batteries, such as those commonly used in light-duty scooters can be overloaded easily when used a prolonged distance on inclines or off-road conditions, especially when heavily loaded. SLA and NiMH batteries are generally not protected against such rigors and are subsequently subject to premature deterioration. The overload protection inside the Li-Ion battery prevents this type of abuse and shuts off the power instantly. You will notice no light on the battery meter. In order to restore power, a brief charge to the battery is necessary. Unless you are in a building, you might have no immediate access to an electric outlet, so you need to do it differently. You need to get off the scooter and with the power switch ON, give it a strong brief push while staying standing. The motor will act as a generator and reset the battery. During the push the light is red and will return to green. A few attempts may be required. Since this procedure is a bit annoying, you need to be smart and avoid such situations in the first place. 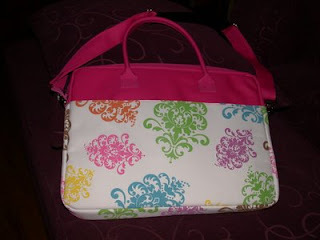 One of the things I bought at Walmart on Saturday was a laptop bag to carry my battery in. I have the lithium ion battery, and I can't leave it in the trunk of my car with my TravelScoot because if it gets too hot it's a fire hazard. This bag gives me a cute and efficient way to carry my 4 1/2 lb. battery with me and keep it protected. And it only cost $20. I put the scoot in the back of the VW Bug and it fits just fine, front tire and all. I didn't put the seat in yet, but there's room, as well as the battery. I am thrilled!!! This means I don't have to sacrifice the back seat (where I keep the collapsable nylon dog crate, for the dog to ride back there). And as far as I am concerned, the Scoot will live back there to be available whenever I need it. I am finding that the scoot, folded and seatless and battery-less is heavy, but not at all too heavy to carry and lift into the car. Now my next task is to find a tote bag that will comfortably carry the battery and seat, as well as the charger, in case I go somewhere where I want to recharge. woo hoo! In retrospect I should have known this might happen -- I pushed my TravelScoot too far today. I zoomed through one Walmart, and then a second Walmart. A motorcycle guy walked into Walmart at the same time I did, and he was obviously impressed. "Wow, you got on that thing and in here fast!" After a break at home I did BOTH floors of a huge mall, then Sam's Club. I was by myself and moving fast. But even so, that was all just fine. The fatal mistake was deciding to drive from Sam's Club across the Sam's Club parking lot, across the street, across the Walmart parking lot to my third Walmart of the day. I was going in the door when it happened. The battery light flashed yellow and then it flashed red, and then all power was gone. I think I overloaded my lithium ion battery, but I didn't have my charger with me to fix it. I folded my scoot up and put it in a cart and took it back to my car. The battery is charging now. I'm thinking a backup battery might be a good thing. Especially for days like today. (Or going to the Smithsonian at the end of July!) I also need to read the battery manual again. Are you embarrassed to be seen on a scooter? Tools to help you walk, like a scooter or wheelchair, are built on the most ENABLING of early technologies -- the WHEEL. Without wheels there wouldn't have been an Industrial Revolution, we'd have no trains or automobiles, no jet engines, no way to transport goods and services, and little ability to travel. I know there are people reading this blog who are embarrassed at the thought of using a scooter. Maybe you can't walk far enough to enjoy the zoo or traverse an airport. Perhaps you don't want people looking at you, thinking you've given up or you're just lazy. The wheels of my scooter enable me to briskly move where I would have been walking slowly and with pain, or more likely not walking at all. My wheels energize my world while saving my knees. I am more active with my TravelScoot. It is up to us to empower ourselves without concern for what others think. If we limit our world over what someone else MIGHT be thinking then we never go sleeveless, never put on a bathing suit, and miss out on grand things the world has to offer us -- museums, big stores, airports, visiting loves ones at the hospital, shopping for ourselves. If you're having trouble walking but are hesitant about using wheels to enlarge your world, please put yourself out there. It gets easier every time you do it. Start with trying a scooter at Walmart, Sam's Club, or Target. (Although good luck finding one that actually works and has a charged battery at Target!) By the time you graduate to a TravelScoot you'll be so thrilled with how it changes your world that you'll be telling everyone. Just like me. Here are Lynn Ellen and Misha again, and THIS time she's riding on grass, but it was flat and not thick. Misha is sitting at perfect attention. My understanding is that TravelScoot doesn't recommend riding on grass or gravel, but obviously with certain types of grass and gravel it works. At least for short stretches. 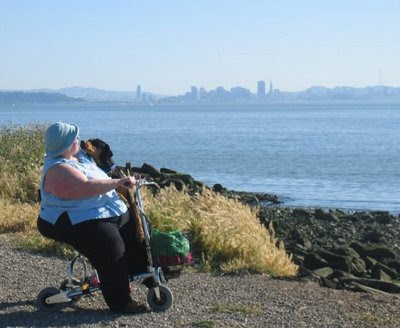 This is Lynn Ellen, with San Francisco in the background. What an amazing picture. And yes, that is hard-packed gravel she is riding on. I tried the same thing in my driveway and didn't even move an inch, so gravel isn't always TravelScoot-friendly, but in this lucky case, it was. Cynth sent me a picture of how she's modified how her basket is attached. She replaced the tie down with a longer camera strap and a plastic latch. 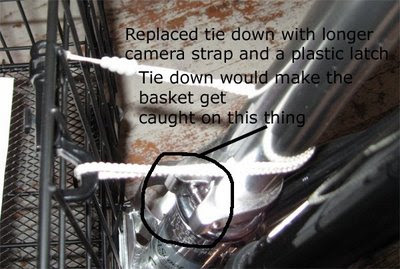 She said the tie down would make the basket get caught on the metal part she circled in the picture. I've tried attaching my basket, but also am having problems with it hitting on the metal "v" part in the picture. I've seen a picture of Lynn Ellen's TravelScoot with the basket attached (and loaded), so I know it works. Bee and Sarge also use theirs. I think I need to have a moment of clarity and try attaching mine again. I took today off (4/17/09) to take care of appointments and decided to just go for it and go to Walmart to do my first in-store grocery shopping in 5 years. It took me a little over 2 hours, but I did it. I wouldn't want to shop during peak hours and once I figure out where everything I need is and on what side of the isle it is it will go smoother. I got in a few peoples way, but then again people got in my way too. And our Walmart has posts in the center of some isles that require shoving the shopping cart past it on one side while I drive past it on the other. I do feel much better now knowing that the scooter will take me shopping. I parked clear out back in the parking lot so I could have room to get my groceries in the car and fold the scooter up and down without someone parking next to me. I also saved about $50 by shopping myself and not using Albertson's delivery. Ok the mission today (4/18/09) was to go to Target. Mission accomplished. 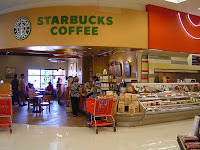 Our Target does have some groceries so I was able to pick up some coffee on sale and various sundry items. I got my grandkids each 2 outfits and had fun looking at all the baby clothes (I had a new granddaughter March 23 and I have twin granddaughters that are 6). As far as the isles go, the main isles are wide enough but the isles that have items on them are too narrow for me to drag the shopping cart through. Well ok, I "could" but that would take up the entire isle and I hate when people do that walking side by side so I avoid it. I decided instead of buying a grocery organizer I'd first try using the box the TravelScoot came in. It should fit across my backseat just fine. Oh and today when I was unloading and loading I was much faster. I watched Hardy's videos again and noticed he does not put the handle bar down when unloading and folding. So I tried that today and it was MUCH easier to get it to "snap". I also paid more attention to how I was getting it in and out of the trunk; I do both with one hand. I really don't find it that heavy at all. Whoo hoo! You are hitting the ground running! Or should I say rolling? It must have been so fun to pick out baby clothes at Target. They have some of the cutest stuff. My Target is a Super Target so it's got a big grocery section and all the department store items too, but at least yours has some grocery items. Yesterday at Target I was able to pull my grocery cart directly behind me when I needed to fit through a narrower space. Most of the time I just park my buggy somewhere at the end of the aisle and zip back and forth putting things in it. I spent about $150 on groceries, so I bought quite a few things. I haven't faced many ramps yet. The tallest one I've been on was 2 - 3 foot tall. I made it about 75% of the way up, then had to put my feet down and help push. Lynn Ellen says the hill up to the church near her house is a bit steeper at first and then is fairly gentle so she just leaned forward and off she went. Ramps going into stores have been easy to handle. I have not yet tried mine on a handicap ramp that takes the place of stairs. 1) Get a good running start. 2) Approach the incline straight on, not from the side. 3) Lean forward. It changes your center of gravity and helps you go forward. 4) If you have to, put your feet down and help propel yourself up. 5) If all else fails, get off and walk your TravelScoot the short distance up the incline. 6) If this is a continual problem, there is an alternate motor that has 11 teeth instead of 13. This motor has its drawbacks though, so it might not be right for you. It cuts down on the total distance you can go on one battery charge, and it lessens your top speed. It's also harder on the belt. You did buy spare belts for an emergency, right? I'd rather just walk my scoot up the occasional steep ramp if I need to. And as far as I know, the 11 teeth motor hasn't been tested by a supersize person. Added note: Empress Bee says that Sarge has one of the lower teeth motors and he wished he didn't. "He had to change the belt on our cruise this past week. my scooter has the other one and the belt is much older than his and still going strong. but we both love our scooters. so many people want them on the ships!" Cynthia figured she would need a stool to sit on while she gets the scoot out of and into the trunk. She went googling for something that would work and decided on a "Nova Heavy Duty Bath Bench Without Back." It ended up costing $96 with tax and free shipping. The free shipping saved a lot, other sites wanted as much as $35 to send a similar bench. Lynn Ellen has a VW New Beetle and this weekend she is going to play with different configurations of loading it into the back. I'm sure she'll share the results with us, so look for them here next week. I have a Toyota Camry and could put two TravelScoots in my trunk. I just remove the seat and u-bar, seat back and battery, and collapse the scoot. Instead of a second scoot I'm going to put a stool in there so I can sit if I need to to assemble and disassemble my scoot. I just folded it up and put it in the trunk for the first time. Every thing went fine and it wasn't that bad to lift into the trunk. I did not break down the basket. It will take some practice to get the thing folded until both hinges "snap" into place quickly. 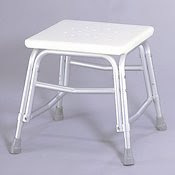 I did not need to use a stool to sit on while breaking it down, but I know if I am tired or its toward afternoon I would need one because I tend to stiffen up after noon. I have an 04 Buick LeSabre and there is lots of extra room in the trunk. 1) The traditional way: Pick a leg and use it to step across the frame then sit on the seat. 2) Lynn Ellen has been stepping thru to get on and since she has not attached the nylon triangle thingy yet she sometimes step into the middle of the triangle and then with that same foot finish stepping through. And when she is not moving forward but still sitting down she moves her feet to the triangle frame. Lynn Ellen on her first day! Now THERE is a happy woman. This is Lynn Ellen on her first day with her TravelScoot. She was going up a ramp when this picture was taken, and she said it handled the ramp just fine. Lynn Ellen got the lithium ion battery. If she wants to she can stack a second battery on top of the first one. Lynn Ellen would like to discuss folding, unfolding and putting it in the car. She says, "That thing is not light." If anyone reading has tips and techniques they'd like to share, send them to me and I'll post them here. I don't have this part working smoothly just yet. My husband does. If you watch Hardy doing it on his website, at http://www.TravelScoot.com, he's got the technique. We're smart women. I'm sure we can learn to do it just like he does, or make up our own way. I've watched Hardy do it in person and it takes him about one second to fold or unfold. "That thing is not light." The TravelScoot is lighter than any other scooter, and it's lighter than most wheelchairs too. I take as many pieces off as I can before I lift it. I take the seat and the u-shaped part off as one piece, although you can also do it as two pieces. I remove the battery. If I were using the seat back I would take that off too. Another trick a friend taught me is to use leverage to get it in and out of the trunk. After you've folded it, if you just lift one end of it off the ground and prop that on the trunk lip, you can then lift the other end and slide it into your trunk. 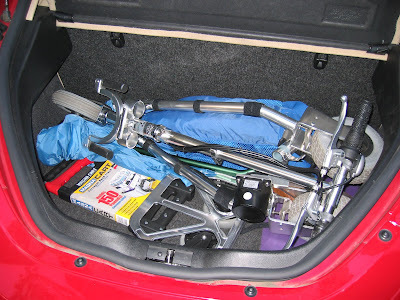 Having a small stool in your trunk could also help if you need to sit while you're dealing with your scoot. I don't know if you all read the comments, so I'm moving Lynn Ellen's comment to a post. Lynn Ellen got her TravelScoot two days ago. The picture is of her walking her dog. Yep. Mine arrived two days ago. I think it is just noisier on carpet. I rode down and up the ramp in front of my building with no problems and then took it home in a friend's truck, where we practiced folding and unfolding it. Yesterday I attached my dog's leash to my waist and took her uphill to the local church parking lot. We then practiced turns so she learns not to get in front of the scoot when I turn toward her. When we went back home I decided to save wear and tear on the brakes and I kept my feet on the ground and sort of walked downhill. On Friday I used my TravelScoot to grocery shop at Walmart. I don't suggest trying this during the holiday rush, but I got a buggy and pulled it from the front using my left hand. I would find a place to leave it near the end of the aisle and zip down the aisle to get whatever I needed. I even bought several 2-liter drinks, but I pulled the buggy down the soft drink aisle for that. The bathroom wasn't too much of a challenge either. The Walmart I shop at normally has a handicap/family bathroom and that's what I prefer to use, but it was out of order so I went in the regular bathroom. I was able to drive it into the handicap stall, and drive it back out when I was done. I did wait until there was no one in the bathroom in case there were problems, but it wasn't necessary. If you've ever used a store cart in Walmart, you're going to find that it's a lot easier to open the doors on the frozen food and milk cases from the TravelScoot. I even was able to handle checkout with no problems. My total was about $120, so I had a lot in the buggy. I pulled in line with my cart behind me, then while the person in front of me was checking out I stood up and unloaded my cart. When I was finished I sat back on my scoot and pulled the cart to where it could be loaded, then I stayed on my TravelScoot and went back to pay. It was easy to pull the cart out of the store to my car and get everything unloaded. I'll definitely use this method again. It's really nice to be able to shop by myself AND to have my own scooter so I don't have to depend on the store having one available. My scoot also goes about 20 times faster than the store one! Will Insurance Pay for My TravelScoot? I asked Hardy Huber about it and he says he knows of cases where Blue Cross Blue Shield and Meritain Health have reimbursed his customers. I did not attempt to get insurance to cover mine. If anyone reading this blog has and would like to share their experience, please post a comment about it. Medicare does not reimburse for the TravelScoot. 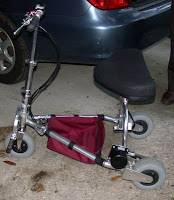 Medicare pays for an electric wheelchair or scooter only if the patient cannot walk at all, even in their own home. Sunday I met friends at a Super Target. While we were enjoying our Starbucks Coffee and talking, we took turns tooling around Target and testing the new seat (love it) and new seat back. The new seat back was comfortable for everyone else, but not for me, and I think it's because I carry a lot of my weight in my back. What I really want to write about today is the throttle. The throttle on the TravelScoot is on the right handlebar. You rotate it toward you and it gives the scoot power. When you let it go the scoot stops, or you can use the hand brakes if you're about to run over someone in Target and need to stop really fast. I've written in this blog about having to lean in a little to get my scoot going, and having to push off with my foot. I'd talked to Hardy about this because I didn't have that problem when I tried his scoot. He figured out that the scoot I got had a different throttle than his. My throttle had about a 5-second delay before it kicked into full power. I'm thinking that's so skinny people don't get thrown off the back if they start too fast, but it wasn't working as well for me. Hardy sent a throttle with no delay and Alan installed it Saturday night. It made an enormous difference in how my scoot takes off. I am very pleased with it. Melissa has ridden mine several times and she thought it was a great improvement too. Rhonda and her husband Dave were there too. Rhonda has a courier service where she delivers legal documents to our governmental building. She has pulmonary problems that cause her to have asthma attacks. She's getting a TravelScoot to use for her business, which hopefully will keep her out of the emergency room this summer. She and Dave learned how to break it down and put it together and they also took it outside and put it in her vehicle. They were so cute. We could see them outside through the window at Starbucks. Dave took a corner on two wheels, and Rhonda went flying by dragging her rolling briefcase behind her. They came back into the store with her driving the scoot with one hand and holding Dave's hand with the other. We got a number of comments from shoppers. One lady came into Starbucks to ask about it for her mom, and several others made positive comments. It was a fun day. Hurry... QUICK... You have to SEE THIS!? Did you see it?! Hurry! 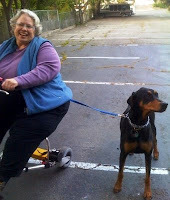 Today I took my TravelScoot to my mom's nursing home for an adventure. She can't walk and she can't easily travel by car, so it's hard to give her a change of scenery. Her nursing home has gorgeous grounds that go on for acres. Soooooo...... I got her out in the hallway and on my left side. I controlled my scooter with my right hand, and grabbed the right arm of her wheelchair with my left hand and we took off, side by side. We went down one hall, and then another one, and then we kept on going until we saw sunshine. "Oh yes!" was her answer to asking if she wanted to go outside, so I opened the door and out we went, side by side down the sidewalk, past the Virgin Mary statue, down the wheelchair ramp and into the parking lot. Sweet freedom. We were going fast enough that the wind was blowing her hair. 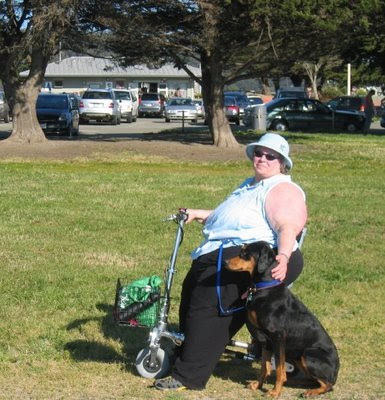 I've always wanted to take her on a long walk like that, but just couldn't. I have a feeling she was the envy of the home today. The "Hurry... QUICK... You have to SEE THIS!? Did you see it?! Hurry!" was something we heard from the other end of the hall. It was someone on the staff telling a coworker to look at what we were doing. Independence is a GREAT thing and the memories we made today are priceless. I was going to do this right, with pictures and everything, but that will have to wait until I am able to take pictures. 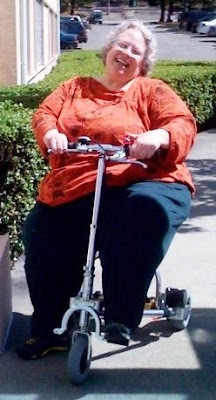 At the 2008 Big As TEXAS Assembly, there was a workshop about scooter useage given by a woman with pulmonary hypertension. She has a professional job, and uses her scooter (not a TravelScoot) at work and anywhere she needs to walk more than a few steps. She has a van with a lift, and is well versed in how to lead a productive, happy life while using a scooter. One of the things she talked about was using her scooter in the grocery store. Her scooter has a small basket, but that's not enough room to shop for family groceries. What she does is to get a regular grocery cart and park it somewhere in the store. She goes and gets things and brings them back to the cart. She also has a laminated sign that she puts on the cart to keep the store employees from thinking it's an abandoned cart. 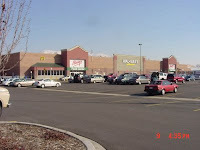 I do something similar, without the sign, but I try to pick stores that aren't crowded and have fairly wide aisles. Our Super Target is good for this sort of shopping. I control my scoot with my right hand (that's the side the throttle is on), and grab the front right side of the cart with my left hand. I can actually roll it behind me like that if I need to, or if the aisle isn't crowded I can roll it beside me. Sometimes I just leave it and bring things back to it. It's worked really well so far. When I get to the checkout I go in front of the buggy and pull it behind me. Then while the person in front of me is checking out I stand up and unload my cart. It's not a perfect method, but it works pretty well. I appreciate my independence very much, and I'm willing to be creative about my shopping methods in order to have it. One cool thing about using the scooter in a big store is how fast it will go. Who cares if you're all the way in one corner of the store in the dairy section and you remember you need a cell phone charger from the complete opposite corner of the store? Just zip right over there, taking great care to SLOW DOWN if there are people walking anywhere near you. Yes, that was the day I heard the comment, "Look Mommy, it's a rocket!" This post is for Lynn Ellen and Cynth, and anyone who is ordering a TravelScoot. You see the red connector on the left side of the battery? Do not, and I mean DO NOT connect the battery connectors together more than necessary. (Like if you have a really strong husband, read this to him several times before he connects the battery.) There IS a warning in the manual about this, but Alan and I didn't pay enough attention to it. I mean, you know, like... WHO reads the instruction manual? YOU should. When it is connected correctly, I can disconnect it with one hand. However, the first time we connected it, it took a pair of plyers and some lubricant to get it apart. Luckily no damage was done to the connectors. I am impressed with being able to plug or unplug it with one hand. undying admiration for this and all seat belt issue work you do." Thank you. It's hard to believe but it's been 10 years since I started the seat belt campaign. For anyone who might be reading who is thinking, "huh, what?" go to http://www.ifisher.com/honda.asp for more information. If you're a big person, and your seat belt is too short, you can find seat belt extender resources there. strong enough to take you up ramps. How much of a grade can it handle? There are slopes at the zoo where I plan on taking my grand kids in a couple of months. This too is the reason I asked if it could be pulled from the front, so if it couldn't haul me up a hill I could walk it up the hill." I've only been using my scoot for 6 weeks and I don't know anyone else my size who has ever used one, so this is a learning experience for all of us. 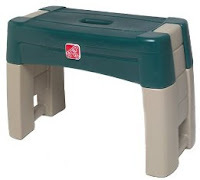 Hardy told me before I bought mine that because of the weight, ramps were going to be a problem. My experience so far has been that I can do minor ramps (like the ones going into stores) without any problem, as long as I get some speed going first and approach the ramp straight on. It also helps to lean my body forward and put my center of gravity more toward the front of the TravelScoot. There was one ramp at the Marriott in Dallas that was at least 2 feet tall, with a short rise to it. I approached it going fast and straight on, and make it about 3/4 of the way up. I stayed on the scoot and walked it the rest of the way up. I kept giving it power using the throttle, because that helped me propel the scoot better. HOWEVER, another thing Hardy warned me about, is that the lithium ion battery has a built in shut-off to protect that battery in case it gets overloaded. He said that battery might be a problem for me because of that. It has not been, not even on the ramp at the Marriott. Two other supersize friends tried it too, with the same results. I don't know which battery you are planning on getting, but I prefer the lithium ion one, both because it's lighter (6 lbs as opposed to 20 lbs) and because it doesn't damage the battery to charge it when it's not fully discharged. I can tell you that what it lacks on ramps it will more than make up for on flat surfaces. I'm amazed at how fast it flies! since I hurt my back 5 years ago." I need to write up some shopping tips for you, and hopefully before long you'll be giving me suggestions. are testing. I hope he is willing." I'm certain he'll be willing to do that, but he doesn't have them yet. As far as I know I have the only one that exists. It's going to take him time to get them manufactured, but I'm sure he'll send you one when they come in. Keep me posted on when you order! Can you walk the TravelScoot? Cynth posted a comment in the comments section, but I wanted to reply to it here and make it a topic. "That looks much more comfortable. the back wheels have to be engaged to let the back wheels spin?" The new seat is comfortable and I prefer it given the choice, but the original seat is comfortable too. It's not the same kind of luxury you can get from the big comfy seats on a standard scooter, but I imagine one of those seats weighs just about as much as the whole TravelScoot. Yes, you can pull the TravelScoot from the front, or walk beside it and push it. It's not my favorite thing to do because it's a little awkward. I usually just sit on it and push with my legs (talk about building up some leg muscles -- who says you can't get exercise from a scoot?) or I could also pick it up and carry it. I don't know how to answer the part about the belt other than to say you can walk with it and the front and back wheels will spin. You just have to be sure the brake isn't set. I set the brake when I get off it to keep it from moving when I'm getting off. I love the new seat! I love the new seat! I still prefer using it without the backrest. I don't need the back support, and I like keeping it as simple as possible so my scoot is even easier to handle. After Hardy Huber met with us in Baton Rouge (http://www.travelscoot.sizepositive.com/), he went back home and designed a larger, more reinforced seat. I received a test version of the new seat today. I haven't had time to try it out yet, but I know some of you are eager to know everything about the TravelScoot, so I'm posting a picture for you. The seat on the left is the original one and the one on the right is the new one. The view you're seeing is of the bottom of the seat. Alan and I are going to switch out the seats soon, and I'll post a review of the new seat. I haven't had problems with the original seat, but if it makes my scoot even better, I'm all up for design options! longer so I could make micro-adjustments to the distance between my feet." 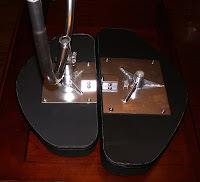 I don't know if a longer foot pedal is a possibility, but I had the same concern before I tried the TravelScoot. I've found that it's not a problem. Even though my legs are very large, the position is much more natural than it might look. And of all the people who have tried mine (and they've been many sizes of large, short and tall) no one has had that complaint. When I'm not in motion on my scoot, my natural inclination is to put my feet down on the ground.